***apologies - the link no longer works and I appear to have lost the original pattern, if I manage to find it I will upload it to scribed*** sorry! I have been making these at night, I seem to have become addicted, they don't take long to whip up. I have made a pattern for them, you can download it for free here. Although it shouldn't need saying, I will. 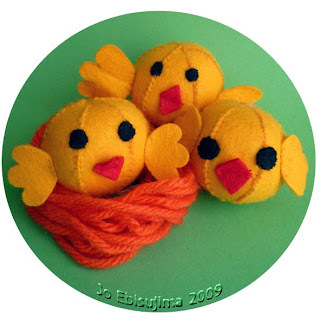 Please only use the pattern for personal use, make as many as you like for yourself or to give away but do not use the pattern to make chicks to sell. those are so cute! great job!! thanks for the pattern. I am going to make some! It will go nicely with my Easter Decorations. And they will make nice teacher gifts. Those little chickens are SOOO cute! I'm wondering where can you get all the Montessori resources in Japan?? how very cute! I can't wait to make some!Thank you for your pattern and tutorial Jo! Those are adorable! Thanks so much for sharing! I'll be linking. Tweenes - I bulk ordered most of it from IFIT - link in the sidebar to the left. Most of the materials I am happy with, don't get the globe, the pink tower and knobless cylinders chipped quite quickly but everything else has been fine. When I ordered, I had excellent customer service but when my friend tried to order a few months later the service was terrible and she gave up in the end. So cute i can't wait to make some later today. Thank you so much also linking you on my blog . I can't get the pattern to download.